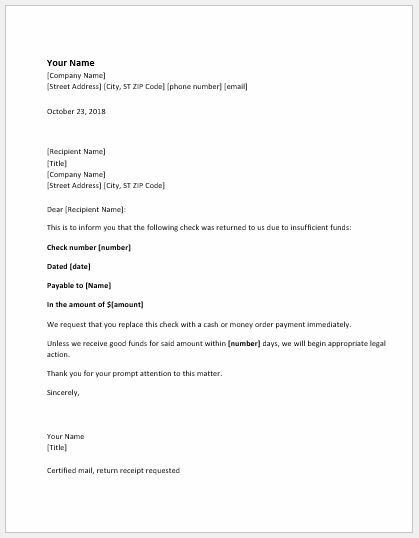 The reporting letter informing about the insufficient funds is written to the person who has provided the bounced check that couldn’t be used to collect the funds. Many companies use this letter to inform the customers that their check has returned because of not having sufficient balance. The cheque was given by the person to pay off the debt. The cheque got bounced, and the collector could not receive the funds. In such a situation, the debt could not be paid off. The main purpose of writing this letter is to demand the money. The letter is started with the issue related to accounting politely. Avoid threatening the reader because the money that you have given to the customer can be at risk. The amount of money that the customer has borrowed. The date at which the customer sent the cheque. The date at which the cheque was bounced. Ending paragraph of the letter has a vital role in the business. In this section, you can write the thank you statement to the customer for being in a relationship with your business. Also, ask the reader to solve this matter as soon as possible. In extreme cases, the legal action that you can take against him can also be stated in this letter. It is a professional letter which should follow the formal wording and tone. The professional letters are never rude but can be assertive. The letter should be ended in a friendly way. There should not be any such wording in the letter that can be offensive for the reader since it can ruin your business relationship with your customer and you may also lose more customers in future. You can make the letter more effective by telling how the bounced cheque is ruining the professional relationship between you and the customers. Also, describe the situation the company has gone through to make the reader feel regret. Following is given a sample letter template that can be used as a guide to draft a good letter for yourself. Hope it helps!